After 13 rapid divisions a fertilized fly egg consists of about 6,000 cells. They all look alike under the microscope. However, each cell of a Drosophila melanogaster embryo already knows by then whether it is destined to become a neuron or a muscle cell — or part of the gut, the head, or the tail. Now, Nikolaus Rajewsky's and Robert Zinzen's teams at the Berlin Institute of Medical Systems Biology (BIMSB) of the Max Delbrück Center for Molecular Medicine in the Helmholtz Association (MDC) have analyzed the unique gene expression profiles of thousands of single cells and reassembled the embryo from these data using a new spatial mapping algorithm. The result is a virtual fly embryo showing exactly which genes are active where at this point in time. "It is basically a transcriptomic blueprint of early development," says Robert Zinzen, head of the Systems Biology of Neural Tissue Differentiation Lab. Their paper appears as a First Release in the online issue of Science. "Only recently has it become possible to analyze genome-wide gene expression of individual cells at a large scale. Nikolaus recognized the potential of this technology very early on and established it in his lab," says Zinzen. "He started to wonder whether — given a complex organized tissue — one would be able to compute genome-wide spatial gene expression patterns from single-cell transcriptome data alone." BIMSB combines laboratories with different backgrounds and expertise, emphasizing the need of bringing computing power to biological problems. It turns out the institute had not only the perfect model system — the Drosophila embryo — to address Rajewsky's question, but also the right people with the right expertise, from physics and mathematics to biochemistry and developmental biology. "The virtual embryo is much more than merely a cell mapping exercise," says Nikolaus Rajewsky, head of the Systems Biology of Gene Regulatory Elements Lab, who enjoyed returning to fly development 15 years after studying gene regulatory elements in Drosophila embryos during his post-doctoral time at the Rockefeller University. Using the interactive Drosophila Virtual Expression eXplorer (DVEX) database, researchers can now look at any of about 8,000 expressed genes in each cell and ask, "Gene X, where are you expressed and at what level? What other genes are active at the same time and in the same cells?" It also works with the enigmatic long non-coding RNAs. "Instead of time-consuming imaging experiments, scientists can do virtual ones to identify new regulatory players and even get ideas for biological mechanisms," says Rajewsky. "What would normally take years using standard approaches can now be done in a couple of hours." 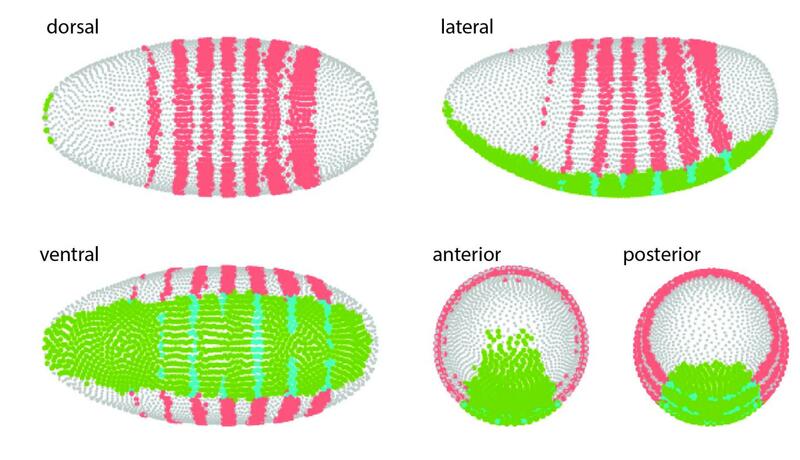 As the data got better and better, Nikos Karaiskos, a theoretical physicist and computational expert in Rajewsky's lab, took on the challenge of spatially mapping such a large number of cells to their precise embryonic position. None of the existing approaches in the field of spatial transcriptomics was suitable to reconstruct the Drosophila embryo. "It was a reiterative process to filter the data, see what is inside and try to map it. It changed many times along the way," says Karaiskos. There was a lot of back and forth between members of the computer lab and wet lab — exchanges that are a defining characteristic of the BIMSB. "I had to question my work all the time, see where it was lacking and develop something better." He came up with a new algorithm called DistMap that can map transcriptomic data of cells back to their original position in the virtual embryo. It is the first time that it has been possible to look at the about 6,000 cells of the embryo individually, assess their gene expression profiles — and understand what determines their behavior in the embryo. "The most important technological advance of this study is that we don't lose the spatial information that is required to understand how embryonic cells act in concert," say the scientists. "This really is unchartered territory and requires new bioinformatics approaches to make sense of the collected data. This worked beautifully in our collaboration, not least because of the unique make-up of the Rajewsky lab, which integrates wet lab and computational approaches." One major advantage is that both groups are not only interested in technology but have specific biological questions that motivate them, says Rajewsky. "Robert has a deep understanding of early development. We can do single-cell sequencing runs and have the computational power to develop the tools that help us actually understand the underlying gene regulatory interactions." The Max Delbrück Center for Molecular Medicine in the Helmholtz Association (MDC) was founded in Berlin in 1992. It is named for the German-American physicist Max Delbrück, who was awarded the 1969 Nobel Prize in Physiology and Medicine. The MDC's mission is to study molecular mechanisms in order to understand the origins of disease and thus be able to diagnose, prevent and fight it better and more effectively. In these efforts the MDC cooperates with the Charité – Universitätsmedizin Berlin and the Berlin Institute of Health (BIH) as well as with national partners such as the German Center for Cardiovascular Research and numerous international research institutions. More than 1,600 staff and guests from nearly 60 countries work at the MDC, just under 1,300 of them in scientific research. The MDC is funded by the German Federal Ministry of Education and Research (90 percent) and the State of Berlin (10 percent), and is a member of the Helmholtz Association of German Research Centers.